It can be hard to imagine a looming food crisis when you can walk into your local grocery store and see shelves overflowing with abundance. You can find easily find everything you need, and plenty that you don’t. But don’t let the full shelves fool you. While the sky may not actually be falling, the world is facing a food shortage. It’s only a matter of time until it hits. Until then, the government wants you to keep walking into the stores, feeling like everything is fine. The world’s food situation is not fine. Here are just eight of the many indicators that it’s time to stockpile food, and start growing some of your own. Have you noticed the price of groceries rising in your area? I sure have here, especially for basic staple ingredients such as butter, flour, and rice. Every time I head to the store, it seems like I have to stretch my food dollars a little further. It’s not just in my neck of the woods where prices are creeping up. According to a study by the USDA Economic Research Service, supermarket prices are expected to rise .25-1.25 percent during 2016, and 1.0-2.0 percent during 2017. While those percentage points may seem low, they’re still moving up. But, since the price of gas and food are intertwined, those numbers could soar past predictions if gas goes up again. Most of the food in the supermarket wasn’t grown in your local area. It was shipped there, requiring fuel. As food prices continue rising, it’s getting harder and harder for families to buy what they need. That means the number of families now getting food assistance from the government continues to grow. It’s not a healthy outlook for our food supply. Plants need water to grow and produce harvestable yields. As temperatures around the world rise, droughts are becoming more common. Widespread droughts are hitting fertile cropland across the planet. From California to India, low rainfall and high temperatures cause devastation on crop production. Long-term forecasts indicate these weather patterns are likely to continue. It’s not just the weather wreaking havoc on our food supply, it’s also disease. From the virulent Panama disease taking out bananas to African Swine Fever that can wipe out entire pig farms, diseases are running rampant in the food supply. Modern food production techniques such as CAFOs create the perfect environment for peril. In a natural setting, you’d see a couple of pigs on farms across the landscape. They’d be interacting with nature, and have other animals and plant life around to help keep disease causing parasites at bay. Instead, the majority of today’s pig farms are just pigs and concrete all around. When a disease comes in, it quickly moves through the whole herd. Often entire farms have to execute their animals to prevent the disease from spreading. The loss of that many animals plays a role in rising food prices. Supply can no longer keep up with demand. These issues aren’t just a problem for pigs. Cows, chickens, and other animals are being raised in conditions that make them prone for disease. Crops are being raised in similar fashion. Instead of farmers growing a variety of crops, you see corn growing in huge fields for miles around. There are similar fields for soybeans, wheat, and other crops. Have you noticed how often food is being recalled? From peanuts to frozen vegetables, meat to processed foods, it’s hard to trust the establishment to deliver safe food to your table. Listeria, e-coli, salmonella, and a host of other food borne illnesses are harming and killing people around the globe. Modern food handling practices have led to these food safety concerns. Factories play a part in the production of numerous food products. When one factory has a role to play in the bulk of the food system, a containment can quickly spread. Add transportation, storage, and unsafe handling, and you’ve got food that’s ready to play host to multiple strains of bacteria. Then there’s that whole GMO debate. Some countries don’t believe that genetically modified foods are safe for consumption. Others have drunk the GMO Kool-Aid and are pushing them on the marketplace at an astounding rate. That’s another reason to grow your own food. You can pick heirloom varieties that haven’t been modified. No matter what you grow and preserve, be sure to inspect what you stockpile to ensure it’s safe. Crops aren’t just being grown to feed humans anymore. A huge portion of our food supply goes to feed cows. Cows were never meant to eat grains in the first place! Let them eat hay, and that’ll relieve a huge burden on our food supply. Then there’s the whole ethanol thing. About a quarter of US corn is being used for fuel instead of food now. With a food crisis already in the works, using food for other purposes adds to the problem. The family farmer is slowly become obsolete. Small family farms are being bought out by large mega-farms. When single companies have their hands in so much of the food chain, a blow to one can cause huge problems. Conversely, when you have hundreds of small farms producing, it’s easy for the others to step in and make up the difference if one experiences loss. But with rules and regulations definitely favoring mega-farms, it’s no wonder that small ones are selling out and shutting down. As governments continue persecuting small farmers, the number of farms producing your food will continue to shrink. The Fukushima crisis spewed nuclear material onto much of Japan. That soil isn’t safe to grow food in, and probably won’t be for a long time. Nuclear disasters aren’t the only thing polluting our soil. Farming practices that strip all the nutrients out and dump chemicals back in also play a role. Mega-farms don’t tend to care about the soil. They just like the money. Until sustainable practices are used in the ag industry, our soil will continue being mistreated. Bad soil won’t grow as much food. However, it will keep bringing the food crisis closer to our reality. The majority of food on supermarket shelves is highly processed. This is the food that many people rely on to supply their nutrition on a daily basis. This boxed and packaged food hardly resembles real food. Because of this, people are becoming further removed from the source of their food. Many don’t know how to make bread. They don’t know how to cut apart a chicken. They don’t know what animal hamburger comes from. For many people, food just comes from the store. That’s all they know, and this attitude is dangerous. The further people get from their food, the easier it is for a crisis to occur. They’re totally dependent on other people to supply what they eat. When those farms or factories shut down, they simply won’t have a clue how to begin feeding themselves and their family. Ensure you know where your food comes from. If you are currently food ignorant, make friends with some farmers. Do some research. Learn all you can. Feeding yourself doesn’t have to be complicated! To take it a step further, you can educate yourself about local food regulations. Be on the lookout for laws that are restricting your right to feed your family. Play an active role in the political process to end the regulations that are strangling small farms. Source food that’s grown as close to you as possible. Not only will you be supporting your local economy and farmers, you’ll also be eating food that’s fresher. Local sources of food are less likely to be affected by national food shortages. If you’re already used to finding food that’s not in a supermarket, you’ll be a step ahead when the time comes. No matter where you live, you can begin growing your own food. If you don’t have much space, put a couple of containers in your windowsills. Learn how to grow food in small spaces. If you have more space, consider getting some livestock. Rabbits and chickens are allowed in many cities, and you’ll be producing your own meat and eggs. You can continue to expand your survival garden as space allows. Try to grow some of the nutritious foods described in this Survivopedia article. If you grow too much, learn how to preserve your harvest. Freezing, dehydrating, canning, and fermenting are some of the methods used to save food for later. Producing your own food will help you lower your food bill and gain self-sufficiency. Everything you grow better prepares you for the food crisis. Stop buying processed food and take back your kitchen. Learn how to prepare simple, nutritious food that your family enjoys. Good food doesn’t have to be complicated! Each time you go shopping, make it a point to buy some extra food. But, you shouldn’t just buy any food. You really need to stockpile what you actually eat. 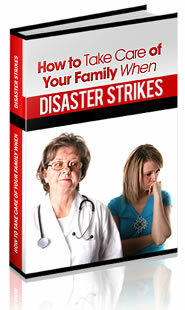 Otherwise your family will have to adjust to both a crisis and new food when the time comes. It’s much better to have food on hand that you enjoy. You don’t have to spend a ton of money to stock up. If your budget is really tight, try allocating just $5 or $10 a shopping trip. While it doesn’t sound like much, you’ll begin growing your reserves. Be sure you store your stockpiles properly to keep pests and bacteria out. You also need to rotate your stores, which is why you should be eating what you’re storing. When I add to my stockpile, I put the new in the back. That way I use the older food first. Have you noticed these eight signs of an approaching food crisis? Are there others you’d add to my list? What basic steps are you taking to prepare? What advice would you give someone who is just starting to develop a preparedness mindset? Please share your tips in the comments section below so others can learn from you! And click on the banner below to find out how our ancestors survived crisis and to learn their tricks!